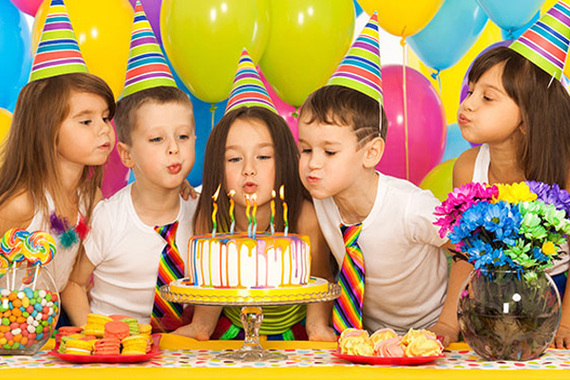 Young children are easy to please with fun birthday party ideas. Many of these can be adapted for age with parent helpers. Whether just a few guests invited to a home party or a large group is gathered, most of the following ideas can be managed with little effort or cost. Many children have a favorite TV show, hobby, or animal that can be made into a birthday theme. Parents may be able to use the child’s toys and items for decorations. Some other easy themes for little kids include rainbows, trucks, animals (turtles, cats, dogs), ocean (“under the sea”), craft or game day, tea party, outer space, or nursery rhymes. Stencils or stickers can decorate homemade invitations to match the party theme. The Internet is full of free printable invitations for coloring that the birthday child can decorate to use as invites. If scrapbooking supplies are available, scraps can be used to make cute “craft day” party or otherwise themed invitations. E-mail invitations are fast and easy. Coloring or decorating a birthday banner could be fun as guests arrive. Story time – Most kids are thrilled when an adult or teen reads a party-themed book to them. String a necklace – children are provided heavy white quilting thread on which they can string Fruit Loops, Cheerios, or some other snack with a hole. DVD – For a little quiet rest time, children can watch a short show that goes with the party theme while cake or lunch is prepared. Little ones enjoy simple games like Ring-Around-the-Rosy, Duck Duck Goose, Musical Chairs, Hot Potato, and Simon Says. There are many toddler snacks to go along with party themes. For instance, Goldfish crackers for an ocean or fishy party, gummy worms for a bug or garden party, animal cookies or crackers for a zoo or other animal theme, or any colorful snack or candy for a rainbow party. Many cartoon-character themed snacks are also available at grocery stores. Healthy snacks could include apple slices with dip, crackers, mini muffins, small cheese slices, and other finger foods made for children. To save money, making peanut butter and jelly, tuna, or other “finger sandwiches” is relatively cheap. Kids generally like healthy homemade salad or kabobs featuring banana chunks and favorite fruits.